It’s now the 10th week of my funteresting event and I feel good that I persisted and kept writing up until now. I hope I can keep the momentum. So what do I want to tell you today? It’s a memory from around 13 years back and yet as fresh in the mind as if it happened yesterday. What happened was a funny instance when I used the incorrect form of a verb in the local language of Karnataka. There was a colleague who had brought some savories and offered it to everyone. I was not feeling like having it so I declined but made the mistake of testing my limited Kannada vocabulary and said “naan beda”. People looked at one another and one of them then understood what I meant and explained to me that my words translated to “I am not wanted” instead of “I don’t want”! (In case you wonder – the words should’ve been “nannage beda”). All I could do then was to join in the laughter. I guess this has happened to every person who has tried to learn a new language – in adulthood (as a child you are allowed to make mistakes and not be embarrassed about it). One other incident which I often tell my friends about, is when a new colleague of mine from China wanted to tell me to check something about the work done by him. Now Chinese is a very difficult language in my opinion and very different from English. So I really admire the people in China who have learnt English – I am sure they would have had their challenges with it. But back to my colleague – he wrote me an email with several people in cc, giving the details of what he had done and then innocently asked, “Can you please feed me back?”. I wasn’t sure how to do that, so I gave the feedback instead! These mistakes were from common folks like me and that colleague of mine – so of course, only a limited set of people know of these. Imagine the impact when someone makes the mistake on national/international TV – not intentionally of course. I wouldn’t delve into that today. May be some other time. Until next, enjoy the weekend. Do let me know of your thoughts via comments or by writing a post about what you fiund funny and interesting in your day to day life. Don’t forget to put a ping back to this post so that I know of it (just insert this URL – https://reflectionsontheriver.wordpress.com/2015/10/03/funteresting-episode-10 in your post). Wow..this week went by too quickly. It seems I can’t keep track of time anymore because it’s flying without even making a sound. So what did I get to know this week that was both funny and interesting? I got to know a very funny expression in German. “Das kannst du deiner Oma erzaehlen” – literally translated it means “tell it to your grandmother”. This is used in response to someone’s unbelievable claim (like me telling my mother who knows me very well that I cleaned my home today and it’s sparkling like hers or that I have started exercising for 1 hour each day!). The reason behind the expression is not hard to fathom – only our grandmas love us so much that they’ll believe everything we tell them :-). You can see it in action below! And now that I am at it, I will list down some more, which I find really funny. One of them is “zum lachen in den Keller gehen” – this one translates to “he goes to the cellar to laugh”. It is used in the context of someone who is so serious all the time that one would wonder if he ever laughs or needs to go to his cellar to laugh so that nobody sees him doing that! Then there are two of them which have their origins in World War I. They are funny now but may not have been so originally. The first of them is “null acht funfzhen” which is basically the numbers “0 8 15”. This is used in the context of describing something mediocre. It sounds funny now but may not have been so for the soldiers who were given these machine guns MG 08 model 15 which were probably not so good and tedious to handle. The second one is “Ich verstehe nur Bahnhof” – which translated means “I understand only train station”. The expression is used to convey the feeling that you are not understanding anything in the lecture/conversation. The origin according to Wiktionary is in WWI, when the soldiers were so tired of fighting and wanted to return home that all they could see in their minds was the train station where they would board the train that would bring them home! There are tons of them in every language. They are the spice of conversation. If they weren’t there, the conversation would be so bland and business like. I love the expressions in Hindi, the language I grew up with. Will get to sharing some of them soon. Meanwhile, if you know of some (in any language) that you’d like to share, please do so in the comments section or in a post on your blog. If you want to make an entry to the event, you can do so via a pingback to my post, by embedding this url into your post: https://reflectionsontheriver.wordpress.com/2015/09/26/funteresting-episode-9. Details of the event with some ideas for what you can write about, can be found here. You can also find the previous posts on this theme there. With that I end this post. Have a fun weekend :-). Hi there..another Saturday and time for another funteresting post. You know how I find street artists fascinating. If you don’t, check out this post here. Now I found a very different kind of street artist – a 104 year old lady(!) who makes beautiful crocheted things and spreads them in the city. They call it “yarn bombing the town”. I loved the fun spirit in her and the energy to do something like that. I wonder what she would have been like in her youth! I wish that when I am very very old, then I can also be as energetic and fun spirited as her! So this was my funteresting update for this week. Hope you enjoyed it. I’ll be glad to read something from you – you can post your comments or enter the event via a pingback to my post, by embedding this url into your post: https://reflectionsontheriver.wordpress.com/2015/09/19/funteresting-episode-8. Details of the event with some ideas for what you can write about, can be found here. You can also find the previous posts on this theme there. With that I end this post. Have a smashing weekend :-). Alright, now to the funteresting part of the post. I found this week that there is a photo competition called “Comedy Wildlife Photography“. Everyone must have seen at least one funny animal video on youtube. So this on similar lines, this is about taking comical pictures of animals (of course the subjects themselves weren’t aware that they would be looking funny doing what they were doing!). I loved the pictures submitted there and The Telegraph has chosen a few of the good ones, which you can see here. I do take pictures of animals but somehow haven’t gotten that shot which would be really eligible for an entry into the competition. 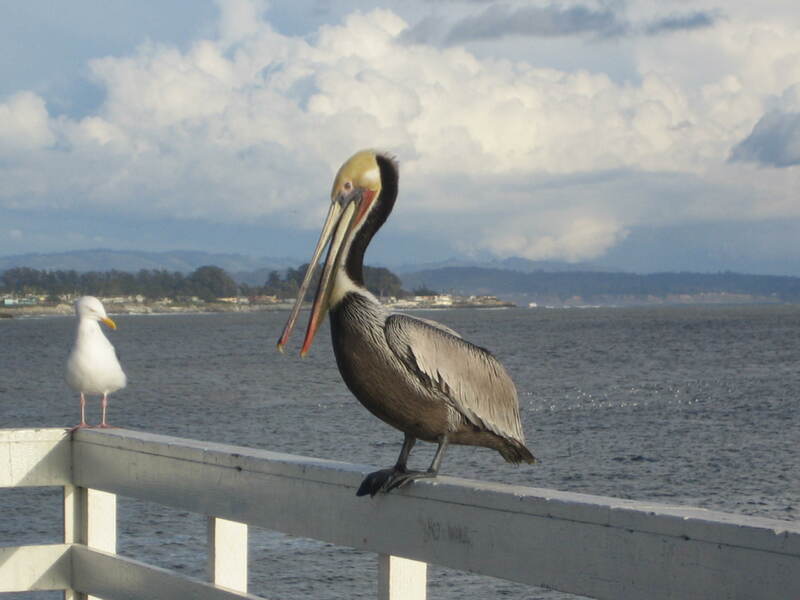 Somewhat funny, from my collection of photos, is probably this one for it made me feel like the bigger one is giving a piece of its mind to the smaller one. Let’s hope that one day I will have at least one decent photo to submit into this competition. Meanwhile if you have one, you could enter the competition. So this was my funteresting update of this week. Hope you enjoyed it. I’ll be glad to read something from you – you can give comments or enter the event via a pingback to my post, by embedding this url into your post: https://reflectionsontheriver.wordpress.com/2015/09/12/funteresting-episode-7. Details of the event with some ideas for what you can write about, can be found here. With that I end this post. Have a superb weekend :-). This week has been quite hectic. I was quite occupied for the first four days with a workshop and thus, Friday was a catching-up-with-work day. So today was taken off by me to do something else instead of getting caught up in the usual weekend activities of cleaning, laundering, grocery shopping and all the other domestic activities. Now, as I sit back and relax, here is a post to let you know ,some interesting things that I wanted to write about since quite some time now. Most of the times, when I read about a “life hack”, it’s usually about something to solve a common issue that we face in our day to day lives. For example, opening the lid of a bottle, peeling a lot of peanuts or garlic faster and so on. Some tricks work while some make you wonder what was the author thinking! There is one website lifehack.org which has tips for various categories such as Communication, Motivation, Relationships,Lifestyle, Family etc. There are dedicated authors there, who probably spend their working hours (instead of spare time like the rest of us) to find things from across the web and present for our use! Interesting work – isn’t it? That reminds me of a remarkable person named Taras Kulakov, better known as Crazy Russian Hacker. Story goes that he used to be an employee at Walmart and made youtube videos in his spare time on science experiments and life hacks. His popularity increased so much that now he is a full time youtuber! In case you didn’t know this – youtube pays the video creators if their viewership exceeds a certain number. So it is quite plausible to make money without a regular job too! By the way, one of my colleague’s young son’s current ambition is to become a famous youtuber – but I guess his motivation is not money but probably fame :-). Back on topic, one life hack tip that I recently employed was to get the coconut meat out of the shell, which usually was a very tedious process for me. The youtube channel is called WOW Recipes and has lots of interesting tips for the kitchen. In case you got curious, the trick is to freeze the coconut and then break the shell. The meat comes out like a ball! Check it out here. Another good one is how to keep coriander leaves fresh for long. I always needed to buy a new bunch every week and throw out last week’s semi-used bunch as it would have rotten in a week, until I employed this trick! Also, if you’d like to, you can post your interesting thoughts on your blog and link them to this post, which is part of the Funteresting event that I host every Saturday (details are on that event page). You can add the link of this post https://reflectionsontheriver.wordpress.com/2015/09/05/funteresting-episode-6/ into your post so that I get a ping back about it. With this I end my post and publish it, before I get another issue with my laptop. Have a great weekend :-). Every weekend when I start to write, I get the same feeling of – where did the week go! There are so many things happening all around the world every moment, some good, some bad, and yet, at times things feel so still. That is a very strange feeling because your scientific knowledge tells you that there is nothing in this universe that’s still – even the rocks which seem to be so immovably solid, are vibrating with energy, while the mind is telling you that nothing’s happening! But that’s not what this post is about. 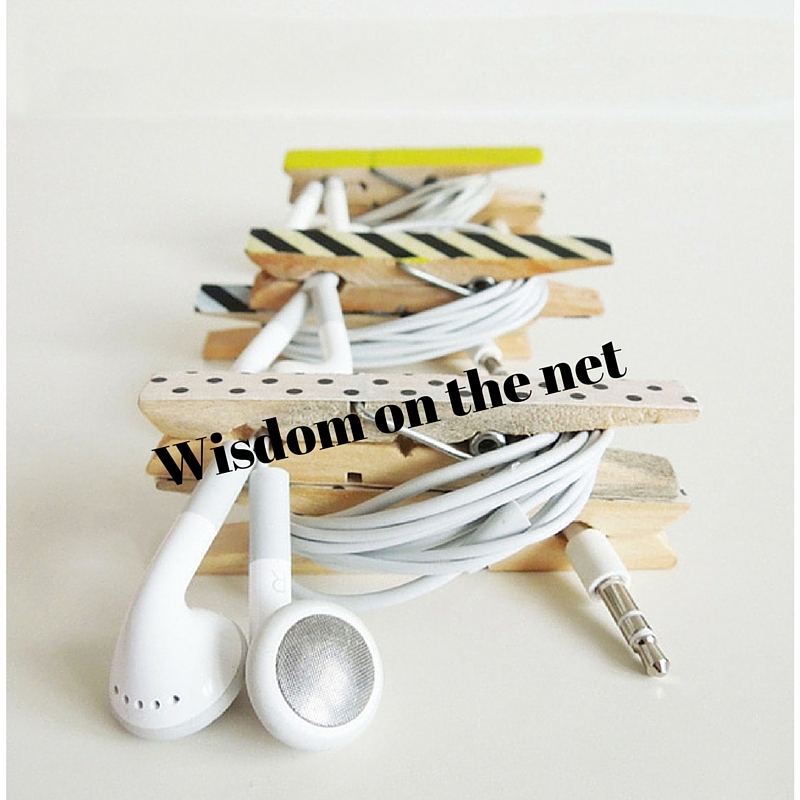 This post is about something that I learnt last week and then delved some more and the ideas are so nice that I felt like sharing with everyone. On a side note, I want to say that I love the internet for all the wonderful news from all around the world that I get through it! So the first article that I came across this past week was about a guy named Bryan Payne who has started a treasure hunting project called “Doodlestones” in his city – St.Louis in the state of Missouri, United States. He takes small rocks from a river near his home and doodles friendly faces on them with a “sharpie” (permanent marker), marks them with the date, #doodlestone and “finders keepers”. Then he puts them in odd places This is his effort to bring a smile on people’s faces everyday. Then people tell him about them on the facebook page. You can read the article here. I just loved the idea and the fact that it doesn’t take too much to bring a smile to people’s faces, which is so important when everyone seems to be struggling with something or the other in their day to day lives! This intrigued me and I looked for more about what other people are doing around the world in their attempts to make this world a better place be it by making someone smile or making their cities prettier or to make a point through the medium of art. It’s so wonderful to know that even with so much destructive stuff going on, there are people with deep artistic sensibilities, who are doing whatever is in their capacity, to make art not as a means of livelihood but to instill hope and inspiration in others. So in this search,next I came across another article about a Brazilian artist named Eduardo Kobra. I got to know that he has done really impressive work across the globe. And now in his home city of Sao Paulo, he has taken to painting colorful murals depicting the city’s issues. You can read the article here. Then I found another article which gives the details of what’s happening in Afghanistan. Due to fears of violence, the rich and influential have kind of fortified themselves behind huge security walls. What do the common people do? They live outside the wall, without any protection. Some street artists and activists have decided to make a point by making some eye-catching graffiti on those walls and putting simple messages.They don’t have a lot of money or funding but they have an indomitable spirit which is fueling them to do this. You can read the original article here. I am a big fan of street artists – not the people who deface structures with random spray paint – but the ones who see the potential in something mundane and with their imagination, bring out the beautiful from that ordinary thing! And this last article in this post shows just that. 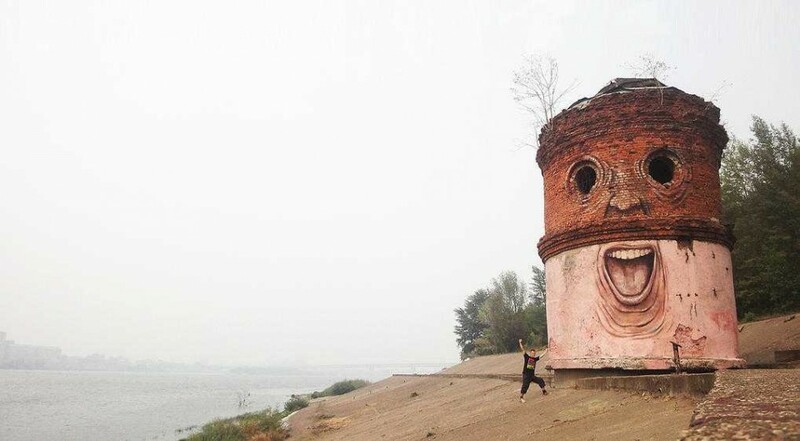 A very talented artist Nikita Nomerz, completely transforms mundane structures, which might even be broken, into something cheerful in the Russian city Nizhniy Novgorod. Have a look at the article here. There are so many more such art-projects going on around the world, people doing things in their own ways to make a difference, showing that it doesn’t matter where and in what conditions you live. If you have talent, you will find a medium to show it. One sentence about the featured image – it is from Leipzig, a city in the eastern part of Germany, which I had the good chance to visit last year. There are numerous such wonderful artistic graffitis all around the city! With that, I will close my post for today. Hope you enjoyed it. Looking forward to your comments and posts, if you like, for the event. You just have to add a pingback to my post by adding the URL in your post and I will be informed – https://reflectionsontheriver.wordpress.com/2015/08/29/funteresting-episode-5/. Have a great weekend :-)..
Another weekend is here and now I am wondering if the time is flying or I am too busy to feel the passing of time! But I remember that when I was younger, there were periods in which I felt that the time is moving too slowly. Like when there would be a power cut in peak summer times (all the people from India know how that is – especially in North India) or when I would be eagerly or anxiously waiting for something or sitting in the classroom trying to pay attention for subjects that didn’t interest me in the least bit (Chemistry). But now, even if I don’t have anything to do, the time seems to be running fast – has the earth started rotating faster? Anyway, that’s not the topic of today’s post. Coming back to the week, I got a very funny video sent to me by a friend. Do watch it. It’s hilarious. Most of the time the actors are speaking in English. So you will understand. Now if you have watched it and are through with your laughing, then here are some serious thoughts. Don’t you feel that although there are so many good things about social media, some people have really taken it to that level where it seems that they have gotten into this obsessive compulsive need to tell everyone about their life 24X7? “Checked in <here>, checked out from <there>, am with <so and so>, eating <this>, drinking <that>” – sounds familiar? Who really cares about all this information? But then I am equally surprised at the number of people clicking on “Like”. Do they really care? Having said all this, I am not not-guilty of doing some of it but may be to a lesser extent. But coming back to the topic. The satire above really poses this question – why do we do something? Because we like it or because we want the others to “Like” it? If one is busy searching for network so that he can update the status, then when will he enjoy the moment? There may be benefits of posting “real time” (like when you are in a jam or there is a calamity and you let others know so that they can avoid it) but most of the time, it is useless information. Gives me the feeling that either the person posting the stuff, enjoys the virtual world more than the real one or her company is so boring that she would rather be on the internet or she is so sad that she is putting on this persona for the virtual world. And all of the above could be wrong and it’s simply an addiction – just like any other, and there is no cure for it! And all this now reminds me of a colleague of mine who told me that he went on a vacation with his family to a place in Ireland (intentionally) where there was no internet access, even the phone was only for emergencies. His children were reluctant to go but then went. But then also, the children wanted to remain glued to their devices (ipads) rather than enjoy the fabulous outdoors! Another one told the first thing wanted by his niece, who came to visit, was the wi-fi password. Anyway, so I will end my ranting here. Hope it gave you something to think about. With that thought, have a great weekend and if you find you are addicted too, then go out, smell the roses and tell me later about it :-)! P.S. I will go out too..without my phone..